Japan's government said 176 people have been confirmed dead after last week's heavy rains in western Japan, as Prime Minister Shinzo Abe visited a hard-hit city. 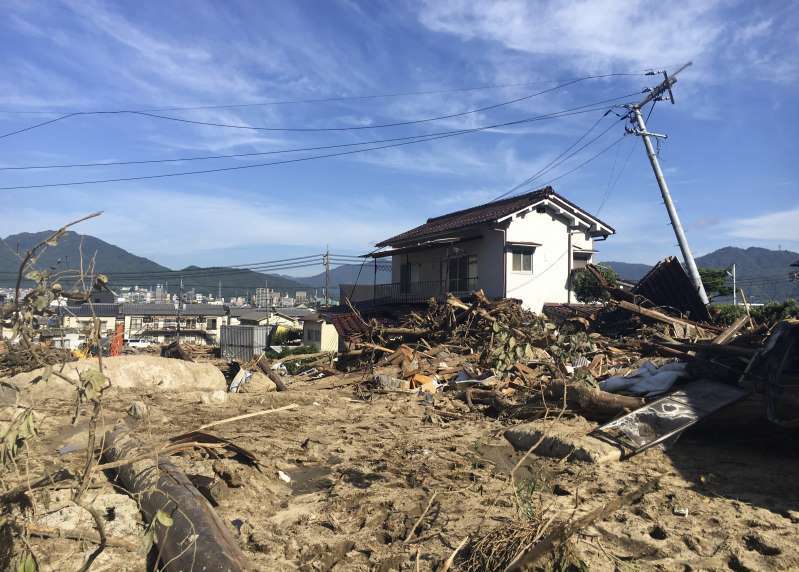 [post_ads]Chief Cabinet Secretary Yoshihide Suga said Abe on Wednesday would visit an evacuation center in Kurashiki, a city where a river broke through an embankment and swept through residential areas, killing more than 40 people. Tens of thousands of rescue and recovery workers and volunteers dug through the debris, as the search for dozens still missing enters its fifth day. Record-setting rainfall caused severe flooding and landslides, toppling and burying homes across a wide swath. Most of the deaths were in Hiroshima and the surrounding area. Resident Tatsumi Kanamori helped clear dirt from roads in a neighborhood in Hiroshima's Asakita ward, where debris has cut off vehicle access. "I'm cleaning out the edges here on the road, because the heavy machinery can't pick up dirt from the curb because it'll get stuck," he said. Another resident, Nobuaki Hyuga, said his house was spared but he expressed incredulity at the nearby damage. "It made me feel like you never know when disaster like this could strike." The government has mobilized 75,000 troops and emergency workers and nearly 80 helicopters for the search and rescue effort, Suga said. Work under the scorching sun was hampered by mud and heat. Water and other relief supplies were scarce in some areas. Shipments of relief goods have been delayed by damaged roads and transportation systems. "No water, food, nothing gets here," Ichiro Tanabe, who lives in the port city of Kure, told the Mainichi newspaper. "We are going to be all dried up if we continue to be isolated."